A completed quilt top. "Noah and Matilda" is approx. 79" square. I stitched 36 of the 42 patterns and came up with my own setting. The background fabric has arrived and all will be heading to the local quilt shop for machine quilting. I don't have anyone to hold it up for a photo so a floor view is best that I can do. Most of my fabrics are from a variety of Kansas Troubles lines. My stash of that brand of is pretty much depleted now. 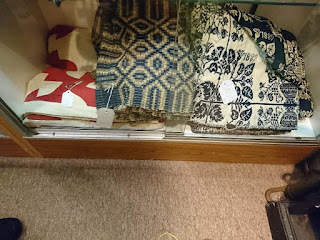 We spent some time antique shopping this weekend. Join me and we'll look together. There were still many red items out from Valentines Day. Good for us because we hadn't been out with all the February snow. But kind of sad too, meaning these treasures weren't sold. 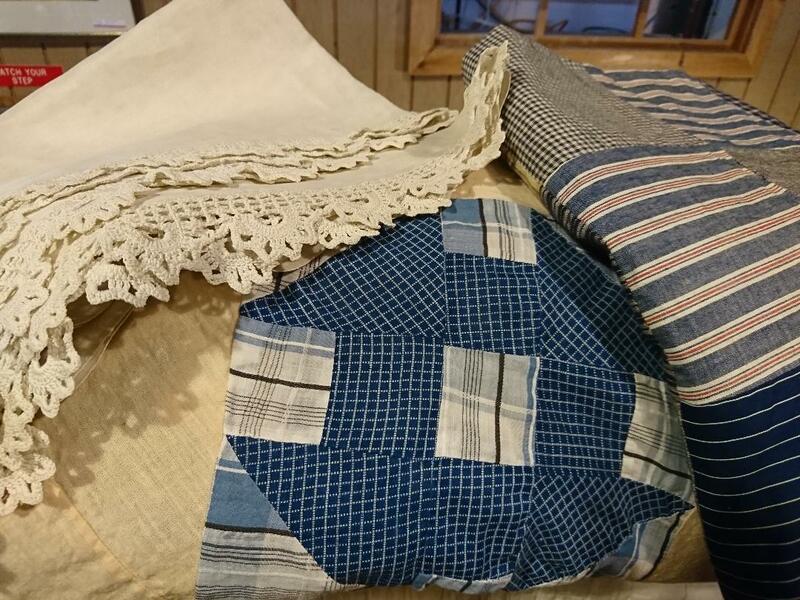 I love the look of linen and lace with blue cottons. The linen so crisp and clean, the hand crochet edging is beautiful. The quilt top was just shirting squares but still quite nice. How has your March started? I'm ignoring the weather and enjoying my stitching time. 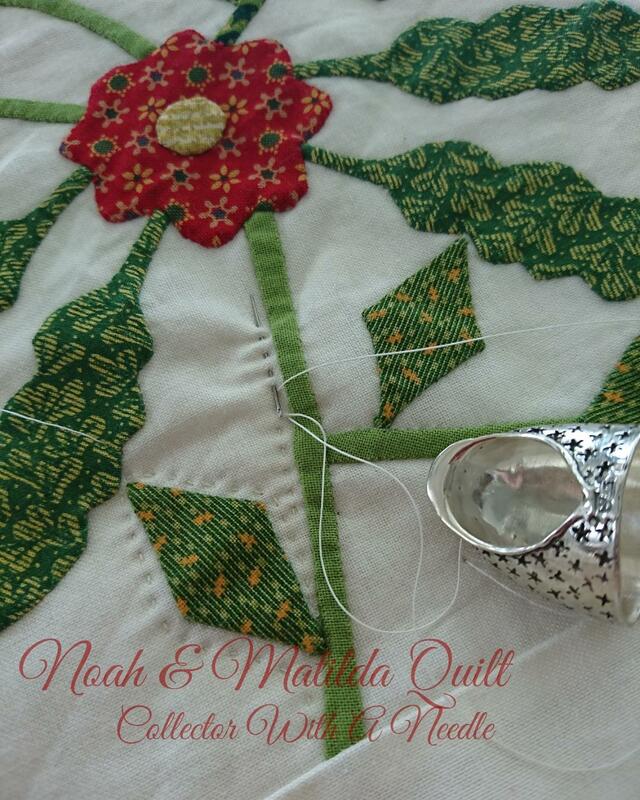 I set a personal goal to complete all of the hand quilting on my full reproduction Noah and Matilda quilt by October. 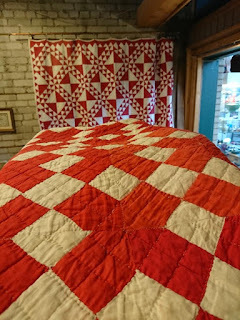 I had it long arm basted, which was nice because I do NOT like basting a large quilt. I have not setup my large floor frame in this house. It was ideal for basting! 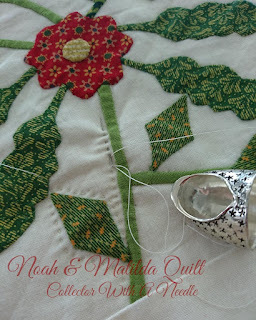 I can easily hand quilt in a hoop. This is a large quilt over 80 x 90! It is so enjoyable to revisit each block as I quilt. A short month so the last day rolled around a bit quicker. I put off until Wednesday morning preparing the "Dearest Boy" block for stitching. A variation of a Crossed Canoes block.